“If you see a lady whom you do not know, unattended, and wanting the assistance of a man, offer your services to her immediately. Do it with great courtesy, taking off your hat and begging the honour of assisting her. “You should never ask a lady at the table to help you to anything, but always apply to the servants. Your first duty at the table is to attend to the wants of the lady who sits next to you; the second, to attend to your own. In performing the first, you should take care that the lady has all that she wishes, yet without appearing to direct your attention too much to her plate, for nothing is more ill-bred than to watch a person eating. If the lady be something of a gourmande, and in over-zealous pursuit of the aroma of the wing of a pigeon, should raise an unmanageable portion to her mouth, you should cease all conversation with her, and look steadfastly into the opposite part of the room. “If you are walking with a woman in the country, — ascending a mountain or strolling by the bank of a river, — and your companion, being fatigued, should choose to sit upon the ground, on no account allow yourself to do the same, but remain rigorously standing. To do otherwise would be flagrantly indecorous and she would probably resent it as the greatest insult. “If you speak for a short time to a woman of condition in the open air, intending to leave her immediately, you should remain uncovered unless she desires you twice to put on your hat. If you are walking with women, or standing with them for any length of time, in the air, keep your hat on. 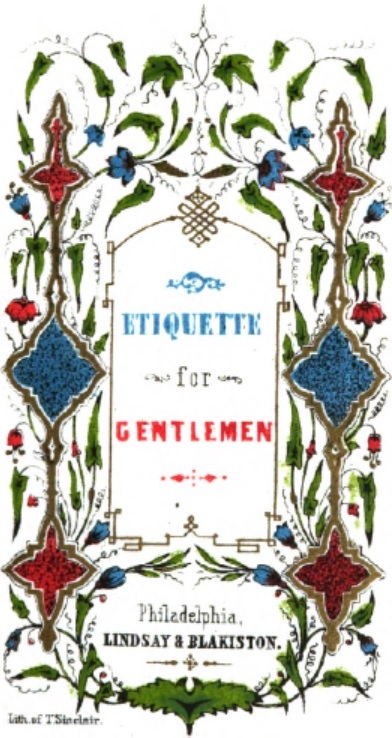 “It is deemed a requisition of good breeding for a gentleman, when paying a visit, or when present at a small party, to stand up when ever the lady of the house rose to pass from one part of the room to another. When the lady rises near you, especially if she has been previously conversing with you, you should by all means rise.